I had a great dive in the Philippines diving at Atmosphere Resort in Negros Oriental and Amun Ini in Bohol. This was really a great opportunity for some warm-water macro-photography, and as I had not even brought a wide-angle lens, this is where I focused. Enjoy the photo gallery. Just back from a great trip to Santa Cruz Island over Memorial day. Did some teaching, and had just about two dives to do some Underwater Macro Photography. I recently purchased a Canon 100 mm USM, which I got to check out. Water was pretty murky, but being able to get just inches away from the subjects does wonders. While shooting one of the Nudi’s a Harbor Seal started tugging on my fins, and came right around in front; that’s when I wished I had had a wide angle lens too. Check out the photo gallery. Just got back from my second trip to Palau, a wonderful place to dive. You can check out the photo album, or see the video slideshow along with some video clips. 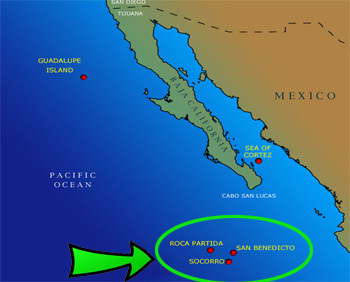 I just returned from a week on the Rocio del Mar diving the northern Sea of Cortez (aka the Gulf of California). We dove along the Midriff Islands and had great encounters with Sperm Whales and Whale Sharks, not to mention the often over-exhuberant Sea Lions. Check out the photos. Recently returned from a 3-day trip on the Horizon out of San Diego. We had two great days at San Clemente Island, and spent the last day outside San Diego, with two dives on the Yukon, a former Canadian Destroyer sunk as an artificial reef and dive site. Unfortunately, it went down early and landed on It’s side; It’s now known as “Milt’s Tilt”. Enjoy the photos. Two great dives at Point Lobos with the Pinnacles crew. First dives with my new Canon T2i/Aquatica set up. Pictures here. Pictures from my drive out from Florida to California moving Brother-Inlaw Jeff Katz and Bear. Pictures really start in Western Texas, with dramatic images of trains and mesas in New Mexico and Arizona, the Hover Dam, Wind Farms in California and the Mojave Airport/Spaceport. New photos from my recent dive trip to the Channel Islands. Just got back from Socorro and associated islands. We dove off of the Solmar V, a very nice dive boat operating out of Cabo San Lucas. I got some wonderful pictures of a friendly Giant Manta Rey who did several fly overs during the course of one dive off San Benedicto Island. Check out pictures from diving in Monterey and Pt. Lobos. Here are photos from our weekend at Nick’s Cove in Tamales Bay with Jen & Ty. The first 9 are from a trip I took there in 2002, well before it was restored. The rest are from the other day. The place you see in the first photo, is actually the “Big Rock” villa we stayed in, before renovation. The Warf has been completely rebuilt and extended. Still very picturesque. Just got back from an interesting trip to San Clemente island. Not too many pictures this time, but some nice action shots of Sea Lions at Santa Barbara Island. Recently, my good friend and local traffic reporting luminary, Stan Burford, got me up in the KGO Radio Traffic helicopter on a beautiful day where I could put my Nikon D200 through It’s paces. I think you’ll enjoy the results. we’re blessed here in the Bay Area with some of the most beautiful scenery in the country. Picture can be found through the photography page on my site, or directly here. Here are some pictures from our trip to Lake Como and Provence. Here are some pictures from my recent trip to the Channel Islands including San Clemente, Catalina and Santa Cruz Islands. Here are some pictures from my recent trip to the Channel Islands, including two days at San Miguel Island. Pictures from dive trip to Bonaire in May 2007. Pictures from dive trip to Cozumel in January 2006: Cozumel 2006-02. Pictures from dive trip to Utila, Honduras (one of the Bay Islands) in April of 2004: Utila 2004. Pictures from dive trip to Palau in January 2005: Palau 2005-01. Pictures from Dive trip aboard the Truth Aquatics Vision in July 2006: Channel Islands 2006-07-15.
here’s a link to pictures I took while diving in Cocos Island in Costa Rica from August 25th through September 5th 2006: Costa Rica 2006-08.